Click the "Workorders" tab in the menu then click "Create New". Assigned To will be automatically set to the Default name in Configuration or name set in "Create PM". You can set this to any name, or leave blank. Equipment is a drop down box of equipment you've added in the "Equipment Admin" screen. By selecting a Location in the Location box above equipment, you can load the Equipment drop down with assets from that location only. 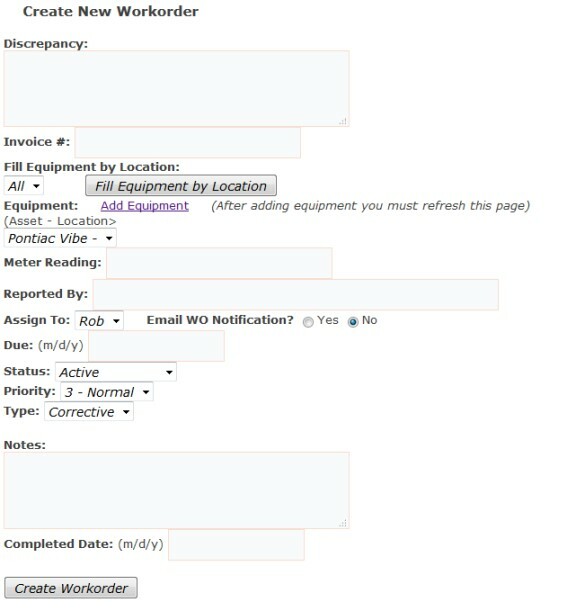 Just select the Location you wish and click "Fill Equipment by Location". You Can Add Equipment if your equipment is not in the current listing. Simply click "Add Equipment" to the right. A new window will open where you can add the new equipment information. After adding the equipment, you may come back to this window, refresh (F5) the window then select the new equipment. Assign To This drop down is populated from your user page. You can select any user or "All". Due Due date for this work order. PM (Note - PM's generated by the system will be assigned to the PM type. Notes Enter any notes you would like for this workorder. You're Done! Enter as many Work Orders as you wish.